James Otter of Otter Surfboards will cover how sharing their way of making their wooden surfboards with customers in their workshop on the North Coast of Cornwall in the UK, that are designed for a lifetime of waves, is changing the perceptions of what goes into the making of a surfboard and what should be expected of manufacturers. With some stories of individual experiences, James hopes to demonstrate that by not only making a great product that is built to last, but by sharing the process with customers, he is getting people back in touch with their hands and initiating a much longer lasting and caring bond between surfer and surfboard in his effort to make the world of surfing a more sustainable one. 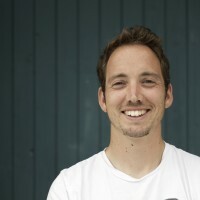 James is a craftsman who builds wooden surfboards and wave riding crafts at his workshop above the beach at Porthtowan, Cornwall, and shares his passion and knowledge by running regular “make you own” courses through which he aims to inspire surfers to reconnect with their hands and the lost art of making. Surfing and woodwork are my two greatest passions and so it was fairly inevitable that at some point I would make myself a wooden surfboard. I wanted to see if I could make a surfboard that was less damaging to the environment, using locally sourced materials and designing it to long outlast its foam counterparts.